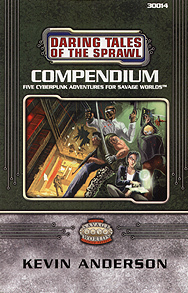 Put on those shades, run a self-diagnostic on your implanted chrome and prepare to hit the mean streets with this, compendium of cyberpunk adventures! Family Affair: A new patron contacts the heroes and pays them a retainer to perform a few odd jobs on a tight schedule: Tampering with food deliveries, "rescuing" a middle-aged couple from an ambulance, keeping them safe and delivering them to the airport are hardly standard missions, but the patron is paying well. Extraction 101: An almost textbook corporate extraction is required. What could possibly go wrong? Quite a lot actually, and the heroes are going to be busy trying to ensure it doesn't. Their mission takes them from the sterile corridors of a corporate tower, to a crosstown race against time, and finally to the ruins of the deregulated zone. Tail Chasing: A straightforward mission to discover what happened to a stolen prototype and a prior team sent to find it leads to the heroes being given the runaround! From a missing broker's junkyard, to a mercenary haunt, to the ruins of the deregulated zone and a commune that has opted out of the sprawl, the heroes must follow a twisted trail to find the prototype they seek. When they find it - is it what they expected? Band on the Run: What should be a simple investigative case has the characters scouring the Conurbation, the deregulated zone, the Amazon rainforest and the Gobi Desert. Band on the Run pits the heroes against kidnappers, eco-terrorists and a bike gang, not to mention pitching them into the midst of a corporate war! Escape Clause: What does a hostile extraction that goes awry have to do with a clandestine meeting at the Eiffel Tower or a massively multiplayer online roleplaying game? They do all have something to do with the mysterious "Achilles Protocols" but can the heroes survive long enough to find out what this all means?